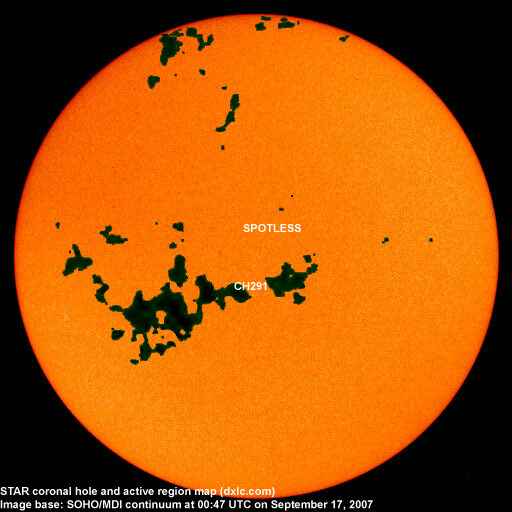 Last major update issued on September 18, 2007 at 02:15 UTC. The geomagnetic field was quiet on September 17. Solar wind speed ranged between 286 and 331 km/s (average speed was 306 km/s, decreasing 39 km/s from the previous day). Solar flux measured at 20h UTC on 2.8 GHz was 66.8. The planetary A index was 2 (STAR Ap - based on the mean of three hour interval ap indices: 2.5). Three hour interval K indices: 00001112 (planetary), 00001012 (Boulder). September 15-17: No obvious fully or partly Earth directed CMEs were observed in LASCO imagery. 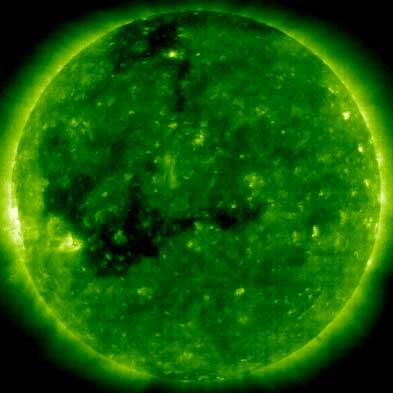 A large, recurrent trans equatorial coronal hole (CH291) will rotate into an Earth facing position on September 16-21. Processed SOHO/EIT 195 image at 00:00 UTC on September 18. The darkest areas on the solar disk are likely coronal holes. Long distance low and medium frequency (below 2 MHz) propagation along east-west paths over high and upper middle latitudes is good. Propagation on long distance northeast-southwest paths is poor. Monitoring remarks from a location near N58E06: September 15-16: Stations like 800 VOWR, 930 CJYQ and 1070 CBA were audible as early as 21:45 UTC. Between 22 and 23h UTC several stations from Brazil could be heard with weak signals. After 23:30 UTC many stations from the northeastern USA had fair to good signals. During the morning signals were weaker than on the previous day and there were more stations from northern South America. 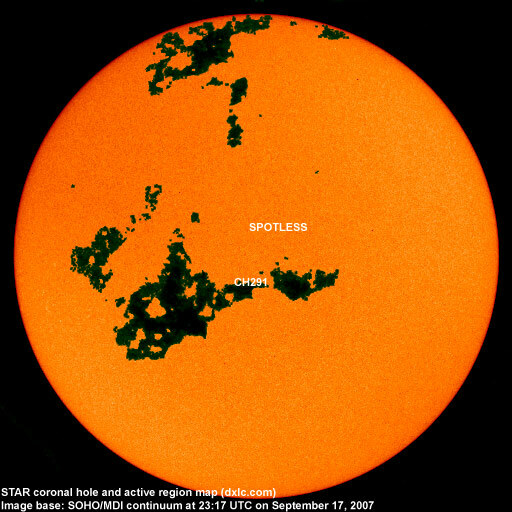 The geomagnetic field is expected to be quiet on September 18. A high speed stream from CH291 could cause quiet to minor storm conditions on September 19-24.